Missing teeth compromise the beauty and function of your smile. Speaking and chewing likely become difficult, and the remaining teeth often shift. Your self-esteem can suffer. Dental implants, the closet prosthetic to nature, can completely revive a damaged smile. Before treatment begins, Dr. Pate will evaluate you to make sure you have sufficient bone structure to support dental implants. 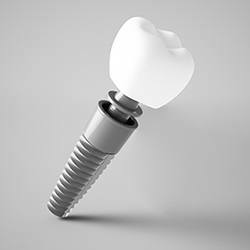 Made from biocompatible titanium, dental implants are small posts that a specialist surgically positions within your jawbone to mimic tooth roots. As your mouth heals, the implants will completely integrate with the jawbone. Dr. Pate will then place prosthetic crowns on the posts, giving you a solid, fully-functioning smile. After implant therapy, you will smile with renewed grace and be able to live life to the fullest. 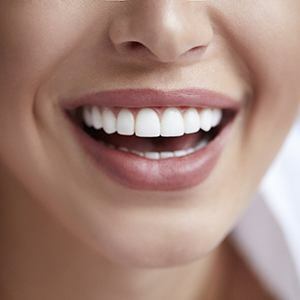 If you’re ready to say goodbye to the gaps in your smile, please contact us today. If you are missing a single tooth, Dr. Pate can restore it using something called an implant-retained crown. This will fit directly into the implant post via a metal connector called an abutment. The crown itself will be made entirely of dental porcelain, which is a material that can be shaped to replicate a real tooth in almost every way, including shape, size, color, and strength. With the proper maintenance, which consists of regular brushing, flossing, and dental visits, your new tooth can last for decades. If you have a row of consecutive missing teeth, two implant crowns can be placed on either side of the gap and bonded to prosthetic teeth to close it, forming an implant-retained bridge. Compared to traditional bridges, implant-retained bridges have a stronger hold and enable a patient to have better chewing and speaking function. It is easier to clean and can be expected to last much longer. Better Fit: Because the dentures will be anchored to your jawbone as opposed to relying on small metal clasps or natural suction, they will be much less likely to slip, slide, pop, or click unexpectedly. Longer Fit: Regular dentures tend to lose their fit after just a few years due to the degeneration of your jawbone, but thanks to the support provided by implants, your jaw will remain stronger and healthier over time, which in turn will ensure that your dentures maintain their fit for much longer. Stronger Bite: Implant-retained dentures enable a patient to have a bite force much stronger compared to a traditional one, allowing them to enjoy a much healthier and varied diet.